Each Space Shuttle orbiter has 38 Primary Reaction Control System (PRCS) thrusters, all of which must periodically be inspected to assure their safe function during delicate maneuvering operations in space. However, this process can be time-consuming, laborious and inaccurate using conventional manual inspection and measurement methods. LTC's laser-based scanning sensors are an ideal solution to this type of problem. 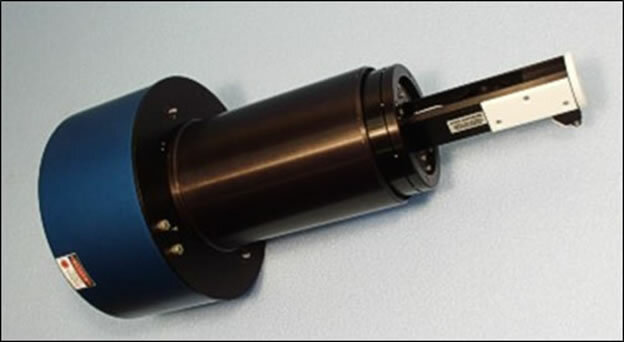 Their small size allows them to scan otherwise inaccessible areas, and they can map virtually 100% of the target surface in a matter of minutes. In addition, the LaserVideo™ image dataset from the laser scanning probe provides valuable qualitative information about the surface condition. LTC is working with NASA to improve its ability to locate and accurately measure chips in the protective ceramic coating on the PRCS thrusters used on the Space Shuttles. In laboratory tests, LTC successfully demonstrated how a miniature laser scanning sensor could be used to accurately measure the chip shown below. 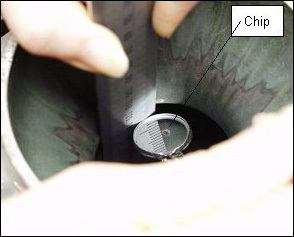 The chip was located in the "throat" of a thruster, an area that is somewhat difficult to access. However, the laser scanning sensor was able to precisely map the surface contour of the chip without difficulty. The laser-based scanning system, now under development for NASA, will also be able to scan 100% of the difficult-to-access combustion chamber as well as the throat area of each thruster. The successful completion of this program will significantly improve NASA's ability to locate, measure and monitor tiny features in the difficult-to-inspect PRCS thrusters – thereby improving their overall safety and useful life. The image below shows an example of the results generated by LTC's LP-2000™ laser-based scanning system. A miniature laser-based sensor was used to scan the throat area of the thrustershown above. 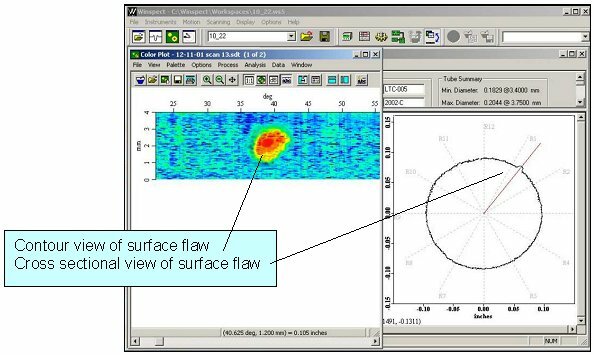 Using the "Zoom" feature, the operator is able to quantitatively examine the chip in the Contour View window. 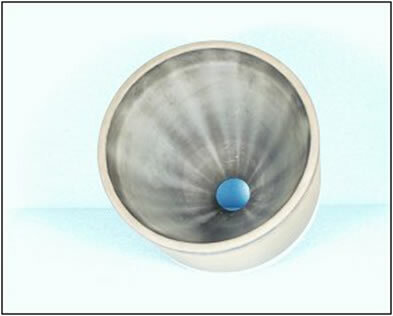 In this case, the feature was measured to be slightly less than 0.08 inch (2 mm) on its longest axis and approximately 0.004 inch (0.1 mm) at its deepest point. All features can be viewed in both Contour View and Cross Sectional View. In addition to direct feature measurement, our software allows operators to apply special filtering and post-processing algorithms, as well as several analysis functions.